Ink and color pencil on 8x10 inch Bristol board paper. Hey, everyone! My buddy, Wyatt L. had a birthday last week. 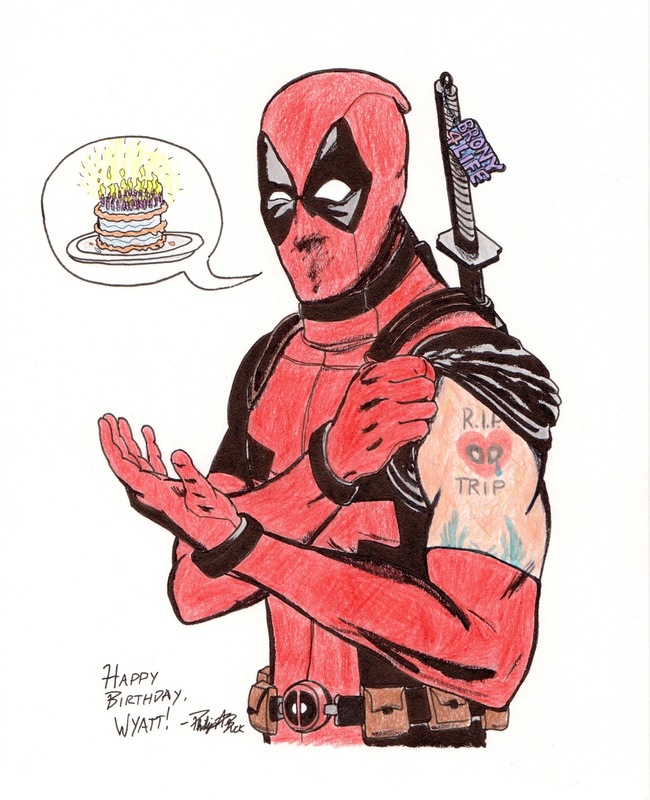 Wyatt's a big fan of Marvel's character Deadpool, so I decided give him a drawing of Deadpool for his birthday. I also added a few inside jokes and things I thought he'd enjoy in the picture too. I also tried a fun visual technique with the word balloon that the great Dan Hipp often uses excellently. Below are the photos of the original pencils, ink drawing, and then a photo of the final illustration again. I hope you all have a fantastic week and if you know Wyatt, and haven't already wished him a "Happy Birthday," feel free to do so! Until next time, God bless!